business, professional and not-for-profit women in Brisbane and environs. have now closed for this event. add your email address to the box at the top of this page. living in a remote Aboriginal community. the opportunities and contribution of volunteering as a Marlpa (assistant) to the Women Elders - and of attending Kapululangu Culture Camp. Kapululangu Aboriginal Women’s Law and Culture Centre is the initiative of the Indigenous women of Balgo/Wirrimanu Aboriginal Community. It was established by the Women Elders to support them maintaining their Law (philosophy) and Culture (customs) and teaching their cultural knowledge to their younger generations. Dr Zohl de Ishtar has lived and worked with the Women Elders of Balgo in remote Western Australia since 1999. She is the founding-coordinator of the Kapululangu Aboriginal Women’s Law and Culture Centre, and she is now its Executive Director. 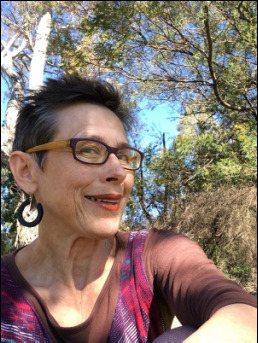 Irish-Australian by heritage, Zohl has worked and lived with Indigenous Australian and Pacific women and their communities since 1979. 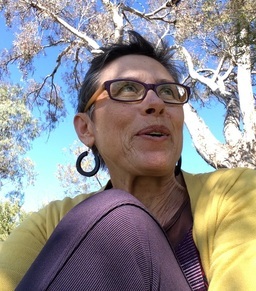 A sociologist with a PhD in Women’s Studies, she is the author of the pioneering books Daughters of the Pacific (1994), and Holding Yawulyu: White Culture and Black Women’s Law (2005). As a consequence of her work with Indigenous peoples and her anti-nuclear education work, Zohl was nominated to the Nobel Peace Prize in 2005 by the Swiss-based 1000 Women for Peace initiative and she is a member of the resulting network of the 1000 “Peace Women Across the Globe”. Zohl and I have been friends plus collaborators and activists together for many years now. We have coached and mentored each other at pivotal points of our lives and vision. We have both worked for the Women's International League for Peace and Freedom. And I have volunteered as a Marlpa to the Kapululangu Women Elders, and co-run an educational project for the young women. A deeper understanding and appreciation of yourself. New perspectives and the opportunity to grow immensely through others' experiences. Insights into the opportunities to contribute to the work of the Women Elders and of Reconciliation. The empowerment gained from spending time with a community of loving, laughing, wholehearted, outside-the-box women who believe in being all they can be - and being a stand for other women to do the same. don't agree and follow the status quo. Be determined that you are making an indelible impact with great change. 43 Gloucester St, Highgate Hill, Brisbane, Queensland. Come along, learn heaps and be inspired. Grow yourself, your relationships and your contribution to the world. you become what you believe." As Chief Inspiration Officer (CIO) at Chris Henderson Coaching, Chris is Australia's Courage Catalyst, a creativity coach and a personal coach to professional women. Chris is also a registered secondary teacher who is passionate about growing courageous, confident young women to achieve their dreams. And she is founder of the Brisbane-based Women Howling at the Moon initiative. Full fee registrations include a donation to support the Kapululangu Women's Law and Culture Centre. Located in the remote desert country of Western Australia, the Centre maintains and teaches Aboriginal Women's Law and Cultural knowledge. Our contribution will help the Elders to run cultural programs for all of their community - young as well as older, men as well as women, non-Indigenous as well as Indigenous residents. Be your own GAME CHANGER for those times small and large where making a difference really matters. to receive updates on future events. We'll love seeing you there and so will you.